Shadow Ridge’s Jordan Ford had 37 carries for 249 yards and two touchdowns on Thursday to lead the Mustangs to a 12-9 home victory over Palo Verde. 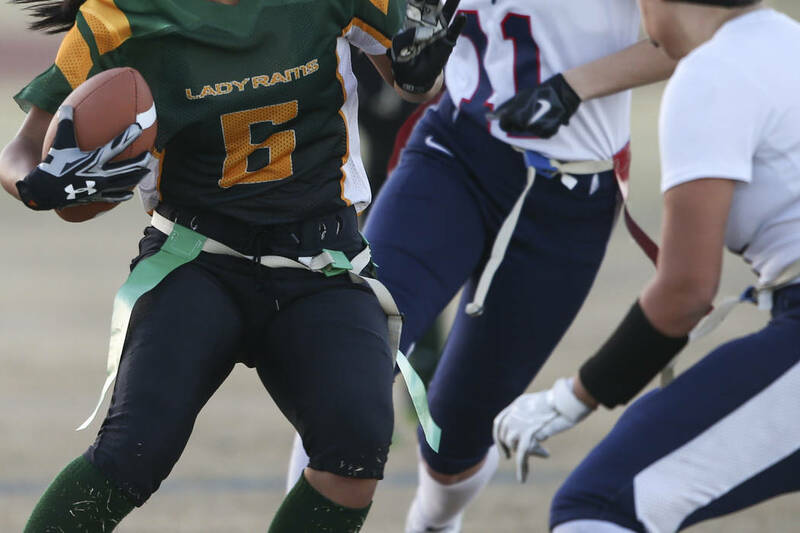 Ford now has 3,145 rushing yards this season, giving her a single-season state record according to the Nevada Interscholastic Activities Association record book. The previous record was 3,104 yards set last season by Western’s Fabray Elam. Ford had TD runs of 1 and 4 yards. Vanessa Almanzor had eight tackles, Sonia Triana tallied seven tackles, and Dayvian Diaz added six tackles to lead Shadow Ridge’s defense. Arbor View 19, Centennial 13 — At Arbor View, Lea Angione threw a touchdown pass to Katelyn Yoakum in the second overime to give the Aggies the win over the Bulldogs. Angione hit Makayla Rucks with a 65-yard TD pass to tie the game and force overtime. Rucks also had a rushing touchdown for Arbor View, which trailed 13-6 at the half. Coronado 26, Green Valley 12 — At Coronado, Caitlin Shannon threw for 154 yards and two touchdowns as the Cougars secured the Southeast League’s top seed for the Sunrise Region playoffs with a win over the Gators. Shannon completed 11 of 19 passes and rushed for 46 yards on six carries. She threw TD passes to Jensen Boman and Reagan Raimer. Taylor Burton ran for a score, and teammate Lexie Potts returned an interception for a touchdown for Coronado. Green Valley’s Jennifer Haberstock completed touchdown passes to Isabel Madrid and Jazlyn Camacho. Cimarron-Memorial 31, Legacy 20 — At Legacy, Tiarra Del Rosario completed 15 of 23 passes for 210 yards and four touchdowns to power the Spartans to victory over the Longhorns. Mya Bethea caught two TD passes, and teammate Genesis Nickerson supplied 95 yards receiving and a score for Cimarron. Natasha Obradovic also had a TD catch for the Spartans. Allanah Subira had 68 yards receiving and a touchdown for the Longhorns. Foothill 26, Liberty 0 — At Liberty, Madisyn McArthur threw for 224 yards and three touchdowns as the Falcons rolled the Patriots. Foothill’s Sydney Babakitis had two touchdown receptions, and Whitley Brow caught eight passes for 114 yards and a touchdown. Babakitis and Keilani Corpuz each had an interception for the Falcons, and teammate Niyah King had nine tackles. Desert Pines 25, Mojave 7 — At Mojave the Jaguars beat the Rattlers. Elena Salazar scored on a 70-yard run for Mojave. Cheyenne 46, Sunrise Mountain 18 — At Cheyenne, the Desert Shields defeated the Miners. Hope Humes had 23 carries for 245 yards and three TDs for Sunrise Mountain. Silverado 26, Basic 6 — At Silverado, Katie Mulligan threw four touchdown passes as the the Skyhawks took down the Wolves.